Stone, 25, has been sidelined since mid-January after picking up a bone stress injury to his lower back on England's tour of the West Indies. "They're two big players for us," Bears coach Jim Troughton told BBC WM. "It would be great to have them back. Olly Stone has had another scan which is promising, which gives him a target date of around about June. Belly's the same." 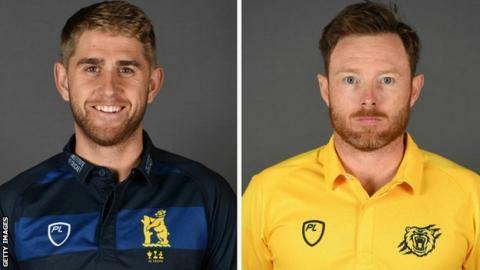 Warwickshire lost their first County Championship game of 2019 by eight wickets to Kent last week, and as well as Bell and Stone, they were also missing winter signing Liam Norwell and England all-rounder Chris Woakes, who has been out with a knee injury. "Aaron had a great game in the university game which would have put him in line for his first-class debut," said Troughton. "But he dived and tweaked a pectoral muscle so he's having a scan on that. "It's very disappointing for him as he'd worked really hard to get himself to that level of fitness. "We know in a long season your squad is going to get tested. Our lack of experience has been compounded by Belly being injured from the start of the season. But we have to deal with it." The Bears, who beat Kent comfortably in last season's final game to win the Division Two title, did at least put up a final-day fight with a 144-run rearguard stand between veteran wicket-keeper Tim Ambrose and young paceman Henry Brookes, in his first first-team game since last July after a stress fracture. "We have to manage Brookesie the best we can," said Troughton. "But he looks in a good place with bat and bal. It was good to see him back in on the park. as he's taken like a duck to water in first-class cricket. "But we knew there'd be some tough questions asked. And it's how we react to those questions. There's no hiding place in four-day first division cricket and we've got to lean fast." The Bears do not play in the Championship again until Hampshire come to Edgbaston on 14 May, but face eight One-Day Cup group games, starting against Yorkshire on Friday, for which Woakes has been passed fit to play in, for his first appearance since the fifth ODI in the West Indies on 2 March. "It's always nice to pull on the Bears shirt and get back out there," he said. "It's an injury that has always been there and has needed managing. "It has good days and bad days but I guess any fast bowler is always nursing something. "Out in the Caribbean it just got to the stage where it wasn't quite manageable but since I got back I have had a couple of injections which settled it down and I am feeling good." This is the last year in which English cricket's longer-form one-day trophy will end with a final at Lord's. And the 2016 winners are keen to be in St John's Wood on 25 May and reach a 20th Lord's final in their 56-year-long one-day history. "The games come thick and fast," said Troughton. "We played really well in it last year and we're just looking for a bit more consistency with the bat." Jim Troughton was talking to BBC's WM's Mike Taylor.